The subscription economy is exploding and everyone is wanting the benefit of recurring revenue. Today the world is awash with subscription options-Netflix, Amazon Prime, SalesForce.com, Dollar Shave Club, and so on. Sure, you offer a dynamite software as a service company, a great training program, a unique product, or vital business intelligence, but how can word of your business cut through all the noise? To gather some insight from an expert in the subscription economy, I talked with John Warrillow, author of bestselling books like Built to Sell – Creating a Business That Can Thrive Without You and The Automatic Customer – Creating a Subscription Business in any Industry. John is also the founder of a subscription-based company called The Value Builder System, where advisors help company owners increase the value of their businesses. Before that, he founded Warrillow & Co., a subscription-based research business dedicated to helping Fortune 500 companies market to small business owners. The lifeblood of every business is repeat customers, says Warrillow. “Automatic customers,” people who buy subscriptions, are the best way to ensure that your recurring revenue continues forever. To give yourself the market edge, you’ll want to pay attention to three numbers: 10, 90 and 3. Once upon a time, the monthly credit card statement had five or six charges—the utility bill, cable TV, etc. Today, small incremental charges—the Netflix subscription, Microsoft Office 365, Birchbox—fill the pages and stretch on. Consumers are feeling subscription fatigue. They’ve raised the bar on what they’ll buy. How do you compete? Warrillow advises that you consider the 10x versus 10% theory. “Try to develop a 10x value proposition that makes it ten times more valuable to subscribe than to simply buy on a one-off basis; because, nobody is going to subscribe to your product or service to save ten percent,” he explains. California-based information marketer New Masters Academy does this. It developed an online learning library. When you subscribe, you can learn watercolor painting, how to make better pottery, and more. Their competition is the community college, where it might cost $600 or $800 to attend a live training workshop. “For $29.95 to subscribe to New Masters, you can make the case that the customer got 10 times the value they would have gotten from going to a single live workshop,” Warrillow says. You’ve sold a membership, time to move onto the next buyer. Wrong. You’ve got the first 90 days to get your customer to be transformed by, or learn to depend on, your product. Otherwise, the member won’t keep the subscription, and that recurring revenue you counted on decreases. The key is to keep your buyer engaged. On the other hand, if you ignore the customer for 90 days, and then see they never used the product you sold to them, you’ve lost them. “There’s virtually nothing you can do after the 90-day period that will re-engage them,” he warns. “It’s why companies like Amazon and Netflix have entire teams, boardrooms full of whiteboards choreographing and storyboarding the first 90 days of their relationship. They will go to the point of really looking at whether to send a third email on the sixth day. They even statistically validate whether it’s better to send that email on the sixth day or the seventh day. It has that big of an impact for them,” Warrillow says. It’s the value of selling subscription programs. Rather than getting a one-time payment you get that recurring revenue coming in. Your business will grow, but there are also cash flow impacts. 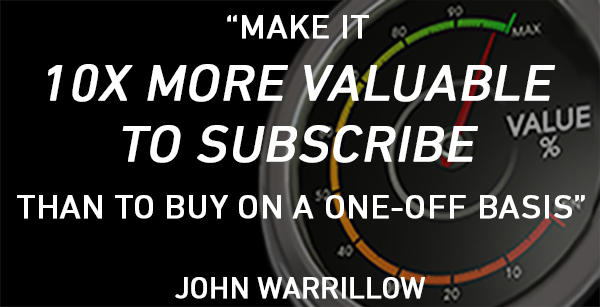 “The most important ratio a subscription owner should track daily is the lifetime value of the subscriber compared to the cost it takes to acquire a single subscriber,” advises Warrillow. He adds that most professional investors considering your business want at least a 3 to 1 ratio. Otherwise, you could be trying to scale up a membership program—quickly signing up new members—only to find the money disappears as fast as it comes in. If you’re selling a product, training course, or a business article one at a time, your income is always tied to your last product launch. Re-engineering your business model to become membership-based can create recurring revenue – income that continues long after the first sale. But subscriptions are harder to sell than other types of products. To set yours apart, design a membership that delivers a 10x value, engage your customers during the intial 90-day window after the sale, and build a model where a lifetime customer spends at least three times what it cost to acquire him. I encourage you to listen to the audio, or read the transcript, of this interview. You’ll find additional nuggets of wisdom if you do so. The links are below. In addition, I recommend that you read John’s books, Built to Sell – Creating a Business That Can Thrive Without You and The Automatic Customer, if you haven’t done so.